The Boston Red Sox have announced that Fenway Park will host an exhibition soccer game between Celtic FC of the Scottish Premier League and Sporting Clube de Portugal, commonly called "Sporting," on July 21. The Fenway Football Challenge will be the 19th soccer game at Fenway, but the first since 1968. It will be broadcast live on NESN, with kickoff at 8 p.m.
Tickets ($20-$120) will go on sale at noon on June 22 at tickets.com. “During its 98-year history, Fenway Park has been privileged to witness some of the best in athletic competition, not only in baseball, but in football, boxing and most recently in hockey with the 2010 NHL Winter Classic. This match is a tremendous opportunity to highlight some of the top talent in the soccer world, and we want to thank Celtic F.C. and Sporting C.P. for bringing the sport here for the first time in over 40 years,” Sam Kennedy, executive vice-president and COO of the Boston Red Sox and president of Fenway Sports Group, said via a Red Sox press release. 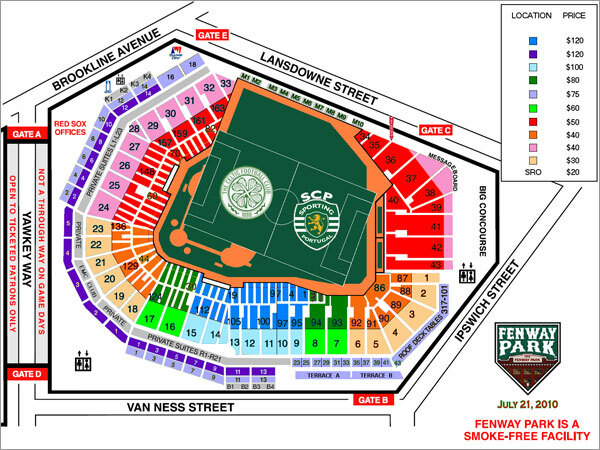 Update, 7:40 p.m.: The image below, provided by the Red Sox, shows the proposed layout of Fenway for the match, along with color-coded pricing for tickets. About Corner Kicks: Julian Cardillo offers insight and analysis about the New England Revolution as well as European and international soccer. We've added a translation feature to the Corner Kicks blog to assist readers who may be more comfortable reading another language. Google Translate is not perfect -- we're aware of that -- but it is quite good at getting the main points of the story across. We've successfully used it on The Big Picture, Boston.com's extremely popular world photography site. I'd be eager to hear your feedback on its use in Corner Kicks, in whatever language.